Microcontinents appear to commonly form on young continental margins close to hot spots, but difficulties in understanding their geology and evolution have inhibited assessment of their global distribution and significance. Thick volcanic accumulations in areas affected by hot spot magmatism only complicate the issue. Elan Bank, a large western salient of the Kerguelen Plateau, is a microcontinent that originally lay between India and Antarctica in Gondwana. 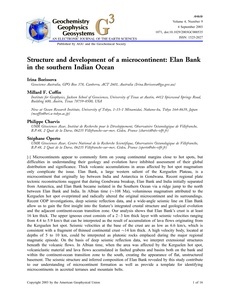 Recent regional plate tectonic reconstructions suggest that during Gondwana breakup, Elan Bank and India initially separated from Antarctica, and Elan Bank became isolated in the Southern Ocean via a ridge jump to the north between Elan Bank and India. In Albian time (∼108 Ma), voluminous magmatism attributed to the Kerguelen hot spot overprinted and radically altered the original microcontinent and its surroundings. Recent ODP investigations, deep seismic reflection data, and a wide-angle seismic line on Elan Bank allow us to gain the first insight into the feature's integrated crustal structure and geological evolution and the adjacent continent-ocean transition zone. Our analysis shows that Elan Bank's crust is at least 16 km thick. The upper igneous crust consists of a 2�km thick layer with seismic velocities ranging from 4.4 to 5.9 km/s that can be interpreted as the result of accumulation of lava flows originating from the Kerguelen hot spot. Seismic velocities at the base of the crust are as low as 6.6 km/s, which is consistent with a fragment of thinned continental crust ∼14 km thick. A high velocity body, located at depths of 5 to 10 km, could be interpreted as plutonic rocks emplaced during the major regional magmatic episode. On the basis of deep seismic reflection data, we interpret extensional structures beneath the volcanic flows. In Albian time, when the area was affected by the Kerguelen hot spot, volcaniclastic material and lava flows accumulated in faulted grabens and basins both on the bank and within the continent-ocean transition zone to the south, creating the appearance of flat, unstructured basement. The seismic structure and inferred composition of Elan Bank revealed by this study contribute to our understanding of microcontinent formation as well as provide a template for identifying microcontinents in accreted terranes and mountain belts.